Are you an electrician and do you need to renew your work equipment? 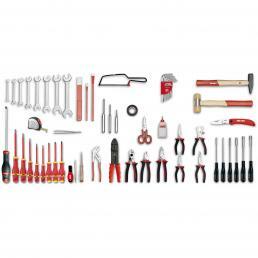 In the Mister Worker™ catalog you can find numerous assortments of electrotechnical tools, designed for professional use and available at a special price. Working in the field of electrical engineering requires the use of specific professional manual tools: first of all, these tools must be insulated, and must be sold with regular certification in compliance with the safety regulations at work. 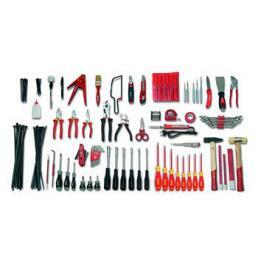 It often happens that you have to completely renew your work equipment, and this is precisely why Mister Worker™ has decided to put in the catalog a series of assortments for electricians: they are complete sets, available in various versions and with a different number of tools, designed for every professional need. Inside the assortment of tools for electricians in the catalog you will find insulated pliers, hammers for mechanics, bribes, hacksaws, cutters and knives, wire strippers, flexometers, electricians scissors, spring turnbuckles, screwdrivers isolated with various fingerprints, hexagonal male wrenches, Screwdrivers, files and much more. 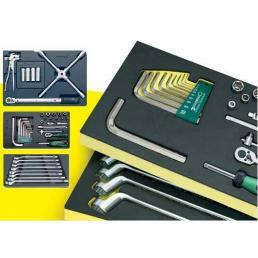 On Mr. Worker™ you will find assortments of USAG tools and Stahlwille tool assortments: we only select high quality hand tools and the best brands on the market, to ensure maximum performance for every professional. If you want to buy more than one set of tools and you need a personalized quote, send an email to [email protected]: our experts will reply as soon as possible, sending you an ad hoc quotation specially prepared for you based on your requests.